Watch Today in AZ starting at 6:00am April 19, 2019 for your chance to win. 2. Eligibility. “TRAIN & GOO GOO DOLLS SWEEPSTAKES” Sweepstakes is open to residents of the State of Arizona, 18 years or older at the time of entry/ Employees of 12 NEWS KPNX-TV, TEGNA Co., Inc., and LIVE NATION and each of their respective affiliated companies, subsidiaries, advertising or promotional agencies, and other agents, and the immediate family members of, and any persons domiciled with such employees, are not eligible. Callers are not eligible if they have won a 12 News Sweepstakes in 2019. 3. Entry. Enter by watching TODAY IN AZ on FRIDAY APRIL 19, 2019 starting during the 6:00AM broadcast. There will be a mention during the TODAY IN AZ broadcast giving the “call now” announcement, the 12th caller will be a winner if the caller meets the eligibility requirements stated in these Official Rules. Tickets can be picked up after 7:00AM FRIDAY APRL 19, 2019 at 200 E Van Buren Street, Phoenix, AZ 85004. 6. Participation. By participating, entrants agree to be bound by these Official Rules and the decisions of the judges. Sponsors reserve the right to disqualify persons found tampering with or otherwise abusing any aspect of this Contest as solely determined by Sponsors. In the event the Contest is compromised by tampering or other causes beyond the reasonable control of Sponsors which corrupts or impairs the administration, security, fairness or proper operation of the Contest, Sponsors reserve the right in its sole discretion to suspend, modify or terminate the Contest. Should the Contest be terminated prior to the stated expiration date, Sponsors reserve the right to award prizes based on the entries received before the termination date. 7. Limitations of Liability. By entering the Contest, entrant agrees that (1) any and all disputes, claims, and causes of action arising out of or in connection with the Contest, or any prizes awarded, shall be resolved individually without resort to any form of class action, and entrant waives his or her right to a jury trial for such disputes, claims, and causes of action; (2) any claims, judgments and awards shall be limited to actual out-of-pocket costs incurred, including costs associated with entering the Contest, but in no event attorneys’ fees; and (3) under no circumstances will any entrant be permitted to obtain any award for, and entrant hereby waives all rights to claim punitive, incidental or consequential damages and any and all rights to have damages multiplied or otherwise increased and any other damages, other than damages for actual out-of-pocket expenses. 8. Construction. All issues and questions concerning the construction, validity, interpretation and enforceability of these Official Rules, or the rights and obligations of any contestant and Sponsor, shall be governed by, and construed in accordance with the laws of the State of Arizona, without giving effect to any choice of law or conflict of law rules or provisions (whether of Arizona, or any other jurisdiction) that would cause the application of the laws of any jurisdiction other than Arizona. The invalidity or unenforceability of any provision of these rules shall not affect the validity or enforceability of any other provision. If any such provision is determined to be invalid or otherwise unenforceable, these rules shall be construed in accordance with their terms as if the valid or enforceable provision was not contained therein. 9. General Release. By entering the Contest, contestants release 12 NEWS KPNX-TV, TEGNA Co., Inc., and LIVE NATION and any other promotional sponsors, and each of their respective affiliated companies, directors, officers, employees, representatives, partners and agents from any liability whatsoever for any claims, costs, injuries, losses or damages of any kind arising out of or in connection with the Contest or with the acceptance, possession or use of any prize (including, without limitation, claims, costs, injuries, losses or damages related to personal injuries, death, damage to, loss or destruction of property, rights of publicity or privacy, defamation or portrayal in a false light). ” contest is sponsored by 12 NEWS KPNX-TV, TEGNA Co., Inc., and LIVE NATION, whose decisions regarding the selection of winners and all other aspects of the Contest shall be final and binding in all respects. Sponsors will not be responsible for typographical, printing or other inadvertent errors in these Official Rules or in other materials relating to the Contest. 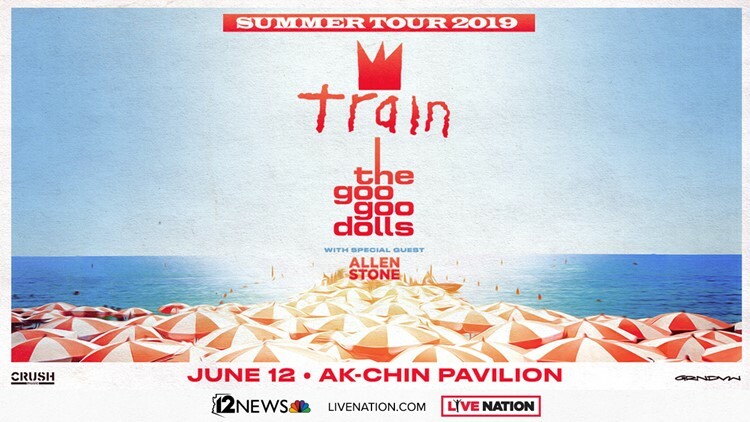 For a list of winners (available after WEDNESDAY JUNE 12, 2019) or a copy of these Official Rules send a self-addressed, stamped envelope to “Winners List/Official Rules” TRAIN & GOO GOO DOLLS, MICHELLE FIERROS 200 E VAN BUREN ST PHOENIX, AZ 85004. If you have any questions about this Sweepstakes, please contact MICHELLE FIERROS mfierros@12news.com 602-444-1285.